The OPI Hydraulic Oil Filtering System utilizes the latest in technology to filter hydraulic fluid used in commercial systems. Industry research states that "Iron and Steel" particles under 10 microns in size are the most damaging contaminants in Hydraulic Systems. The OPI Hydraulic Oil Filter System utilizes the "One Eye" Magnet filter system in combination with premium filters to reduce the size of impurities to 1 micron. With an electronic Magnetic Particle Counter we can monitor the effectiveness of the filtration down to a micron. You might ask, "What is size of 1 micron?" One micron is microscopic as it cannot be distinguished by the human eye. For reference, the diameter of a human hair is about 40 microns. Even new hydraulic fluid should always be filtered before filling up a system. Particularly in systems that have precision machined control valves, small particles in even new fluid can interfere with the performance of the hydraulic actuators due to the tight tolerances that are critical to providing accurate control over hydraulic components. Ask for this tool when filling up your hydraulic reservoir to prolong the life of your hydraulic equipment. 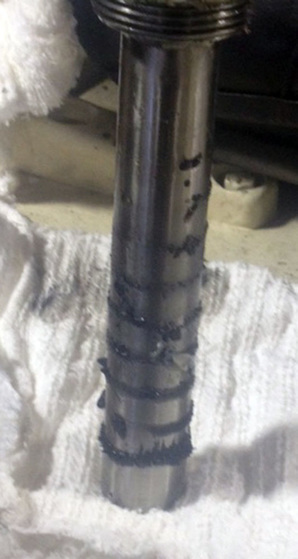 The "One Eye" magnet in the Hydraulic Filtering System after a recent hydraulic filtering session. It shows metal debris picked up the hydraulic oil.